There are two traditional Easter cake which cannot be missed on any Italian Easter dining table: Colomba and Pastiera. Colomba has a dove shape topped with pearl sugar and almonds. This very popular easter cake was invented in Lombardy, probably in Milan, in the north of Italy. Pastiera is a Neapolitan tart, from the South of Italy. 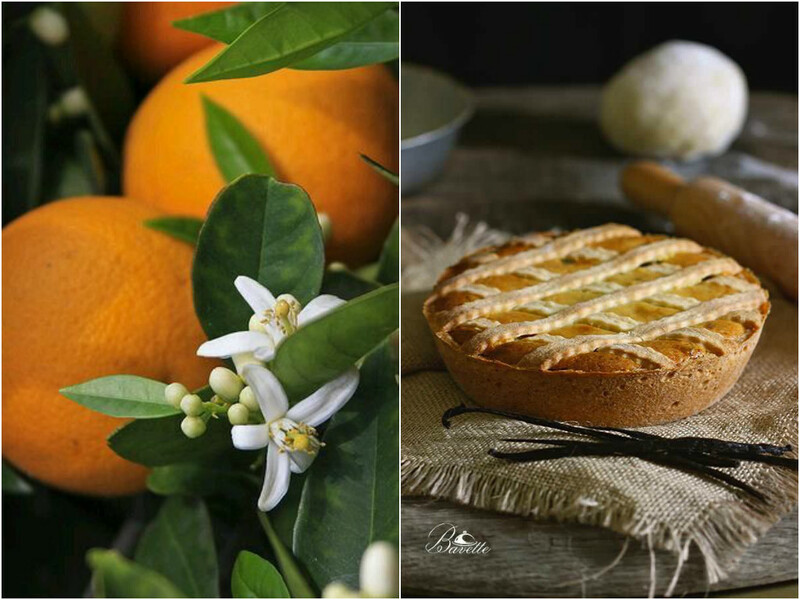 The two ingredients that make it unique are the cooked wheat and the extract of orange flowers. The orange flower water flavor is a celebration of the just started spring season. According to a popular ancient legend, during the night the fishermen’s wives left on the beach some baskets filled with ricotta cheese, candied fruit, wheat, eggs and orange flowers as offerings for the “Sea”, to bring back safely their husbands to their houses. In the morning, when the wives went back to meet their husbands, they noticed that during the night the waves had mixed the ingredients together and that in the baskets of their returning husbands there was a cake: the Pastiera. Besides this legend, it is said that it was a nun that invented the modern Pastiera in the XVI century, in an ancient Neapolitan convent: San Gregorio Armeno. She wanted to bake a cake that had the same perfume of the orange flowers, which grew in the convent’s garden. Another story refers that Maria Theresa of Austria, King Ferdinand II of Bourbon’s wife, accepted to taste a slice of Pastiera smiling for the first time in public after she eat it. Having seen her smiling, Ferdinand said: “ To make my wife smile again I will have to wait till next Easter”. Whichever is the true story, this Easter cake brings happiness and joy to any gathering. So, if you want to celebrate a Happy Easter, follow our recipe and instructions. Traditionally you should prepare the cake on Maundy Thursday or Good Friday to give all the ingredients the time to combine together and create that unique flavor and taste. 1. Put the flour, sugar and salt in a food processor bowl fitted with the metal blade. Pulse to mix the dry ingredients. 2. Cut the butter into 1/2 inch cubes and drop them along with the lemon zest onto the flour and pulse the machine in short bursts about 10 times. The mixture should be crumbly. 3. Put in the eggs and pulse a few times to mix the eggs into the dry ingredients. 4. Sprinkle 3 tablespoons of water on top of the dough. Pulse 6 times for just a second or two. The dough should resemble cottage cheese. Pick up some dough and press it together. If it doesn’t hold together, add another teaspoon of water until dough clusters form. 5. Scrape the dough clusters onto a floured board and need them together just to form a smooth, tight dough. 6. Form a flat disc and wrap the dough in plastic. Refrigerate for a few hours before using. 1. Put the ricotta, eggs, sugar and orange flower water in a large bowl and mix the ingredients well. 2. Mix in the candied fruit and wheat berries. 1. Butter and flour a 9 inch springform pan. 2. Cut about 1/3 of dough and set aside. 3. With a rolling pin, roll out the remaining pastry dough to about 15 inches in diameter. It will be about 1/8 inch thick. Flour the board and top of the dough sticks to avoid the dough sticking to either the board or the rolling pin. 4. Place the dough in the pan to fully cover the bottom and sides. 5. Cut off any excess dough from the pan rim. If the dough breaks just patch it. This is a very forgiving dough. 6. Pour in the ricotta mixture. 7. Tap the pan on the board to ensure the filling is well settled. 8. Roll out the reserved dough into a 9×12 inch rectangle (the pastry should be about an 1/8 inch thick) and cut 1/2 inch lattice strips on a diagonal. Flour the board and top of the crust sticks to avoid the crust sticking to either the board or the rolling pin. 10. Bake in a 350 degree oven for about 45 minutes or until the ricotta filling is well set and a skewer place in the center comes out dry. Turn the pastiera once to ensure even baking. 11. Dust the top with confectioners sugar. Serve at room temperature. If you want to serve a drink with Pastiera choose a well-structured wine, such as Marsala, or a Passito di Pantelleria, or a sherry. 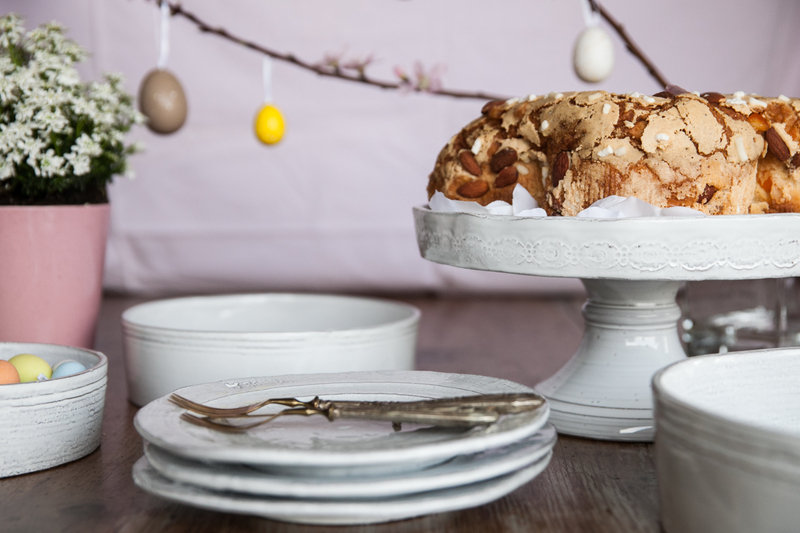 For other serving ideas of your Easter cake, discover our cake-stand collection.